It has been awhile since I did a movie review. Mainly because I try to focus my blog on my antique shop and the adventures of finding antiques. 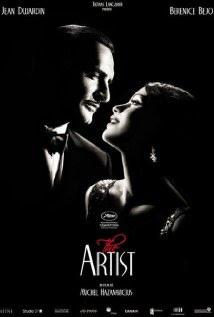 But over the weekend we rented The Artist and I just loved the style of it. Set in the late 1920's the costuming, makeup, props, and well, everything about it just put you right there with the flapper girls. It was even silent. Yes, SILENT. You had to read their expressions and the random words up on the screen to know what was going on. I thought my Dear Hubs was going to go crazy. But he actually hung in there for the whole thing. No sleeping this time, can you believe it? "A silent movie star meets a young dancer, but the arrival of talking pictures sends their careers in opposite directions." It was about so much more than that! He loses everything, his wife, his home, his riches, his fame... until a young dancer whom he had helped in the past comes back into his life. And for that I give it 4 popcorns! Check it out for yourself, you might like it. We found it in RED BOX Movies. I'll be back soon with new listings and a peek at my new rose watercolor painting...and how I am trying to restore it back to "like new" condition! Dear Jillian, Thank you so much for stopping by Creative Breathing. It is my good fortune that you should be reviewing a movie I contemplated endlessly over at the rental store. Now the decision has been made! Please, please do a LuRay post! It is my most favorite pattern, and I can't imagine a collection spanning many years. A must see, five popcorn buckets! I enjoyed your review of "The Artist" and I will put it into my queue on Netflix so I can enjoy it too. I have to go get this movie. I keep hearing how much everyone loved it. Thanks for telling what its about too because I really had no idea.